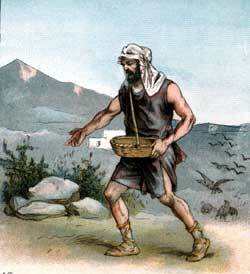 “One day a sower went out to the field with a bag of grain and began to scatter the seeds upon the ground. The breeze caught each handful he threw while walking to and fro, and helped to scatter the grain. But some of the seeds blew upon the roadside. The birds flying overhead saw them lying uncovered on the ground, so they flew down and ate the seeds. “The sower,” he said, “is the one who speaks the word of God, and the different kinds of soil are the different conditions of the hearts of people who hear the word of God spoken. Those who hear the word but do not seek to understand it, are like the roadside by which the seeds fell. Just as the birds flew down and ate those seeds, so the evil one comes by and causes those people to forget the truths they have heard from God’s word. “Those who gladly hear the word of God, but do not continue to obey it, are like the stony places, where the seeds fell but could not grow because they could not take deep roots in the stony soil. “Those who hear and receive the word of God into their hearts, but afterwards allow cares and troubles or riches and pleasures to crowd out the good truths, are like the soil where thorns sprang up and choked out the good seed. Afterwards Jesus told another story to the people. This time he said: “The kingdom of heaven is like a man who sowed good seeds in his field; but while men slept an enemy came to the field and scattered bad seeds everywhere. These bad seeds are called tares. By and by the good seeds and the bad seeds both began to grow. Then he said, “The kingdom of heaven is also like leaven, or yeast, which a woman put into her dough when she was mixing bread. The yeast soon worked through all the dough and caused it to rise light and make good bread.” Perhaps the women who heard this story wondered how the kingdom of heaven could really be like yeast. When Jesus finished all his stories he sent the people away, and afterwards he left the boat and also returned to the city. Then the disciples asked him to explain the meaning of the story about the tares. Jesus said: “The good seed are the people of God; the field is the world; and the man who sowed the good seed is the Son of man. The bad seed, or tares, are the people of the wicked one, and the enemy is Satan.